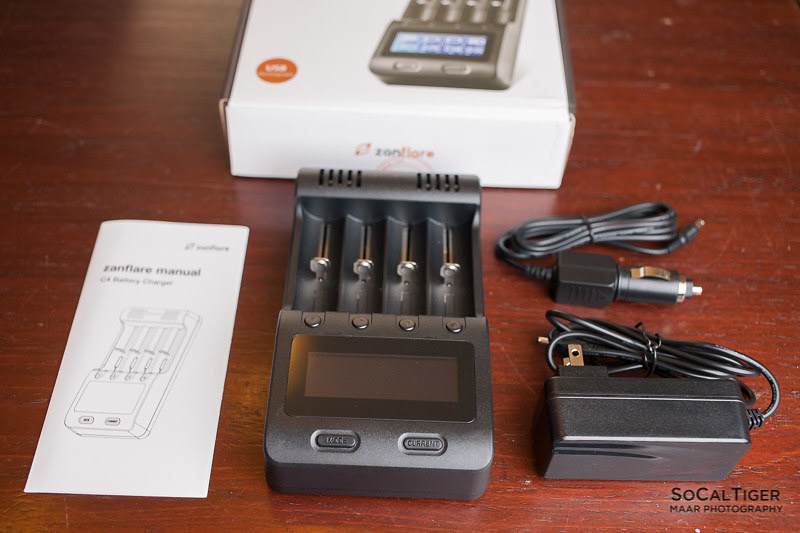 The Zanflare C4 is Zanflare's entry into the Battery Charger market. 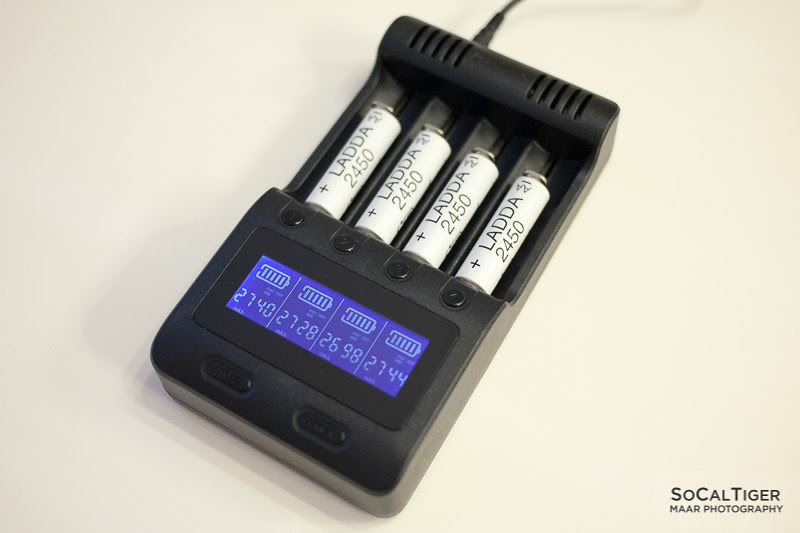 The C4 is a 4 bay multi-functional smart charger which can charge and analyze NiMH, NiCd and Li-Ion batteries. 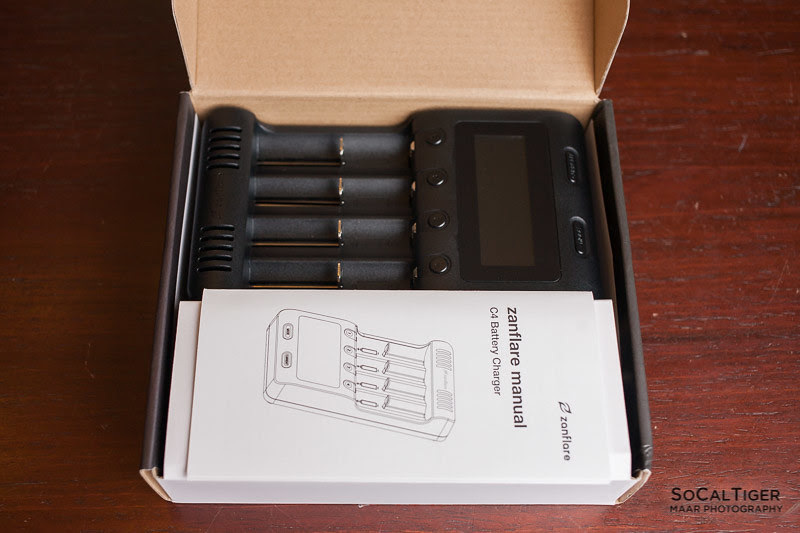 The C4 is great for anyone looking to upgrade from their non-analyzing chargers. I was provided a copy for review by Zanflare (GearBest PRC stock). Both a wall plug and car plug were provided. I really like the inclusion of the car plug so that I can charge my batteries on camping trips. The C4 is made out of ABS plastic and has a mild "texture" which gives the appearance of a subtle sheen as well as helping to reduce the visibility of finger prints. 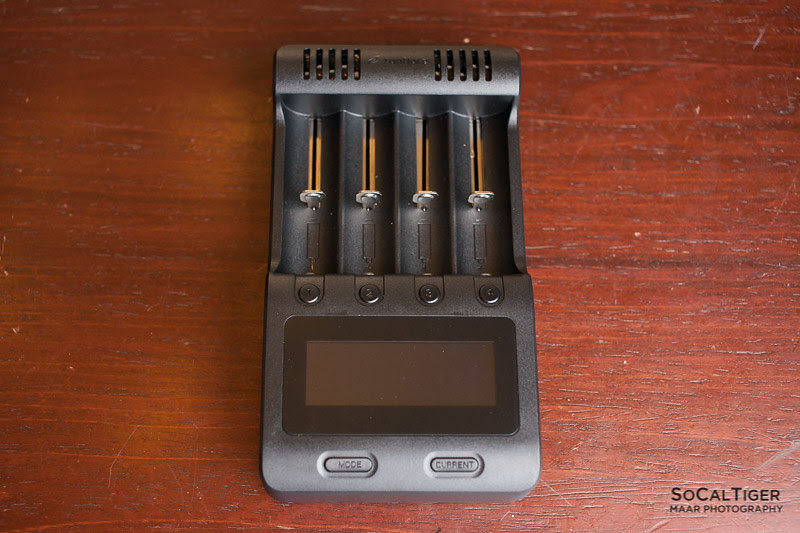 Size-wise, this charger is significantly bigger than the Opus, Littokala Lii-500, Xtar VC4 and Nitecore D4 among others. 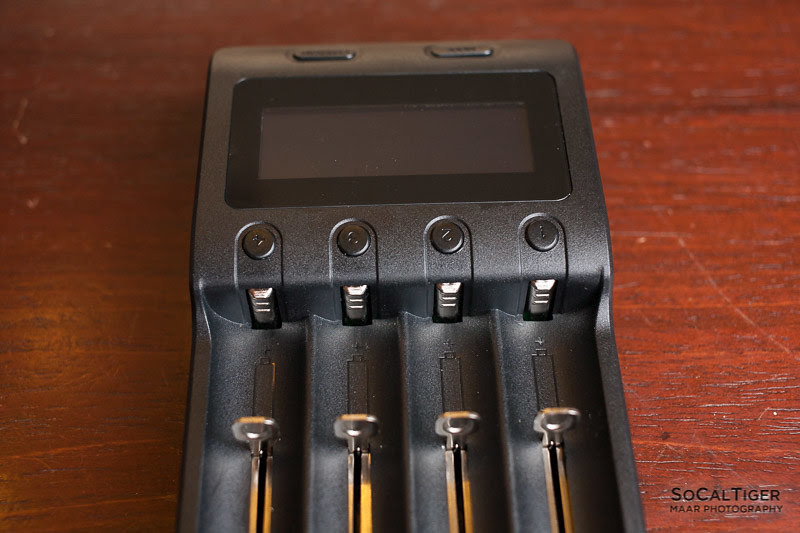 All 4 slots are evenly spaced, which helps make it easier to insert/remove batteries from the center slots. Power input and USB output. Individual buttons for each slot. Lots of ventilation keeps the charger cool. Additionally, since the vents are on the bottom you could set this on top of a laptop cooler for heavy use. 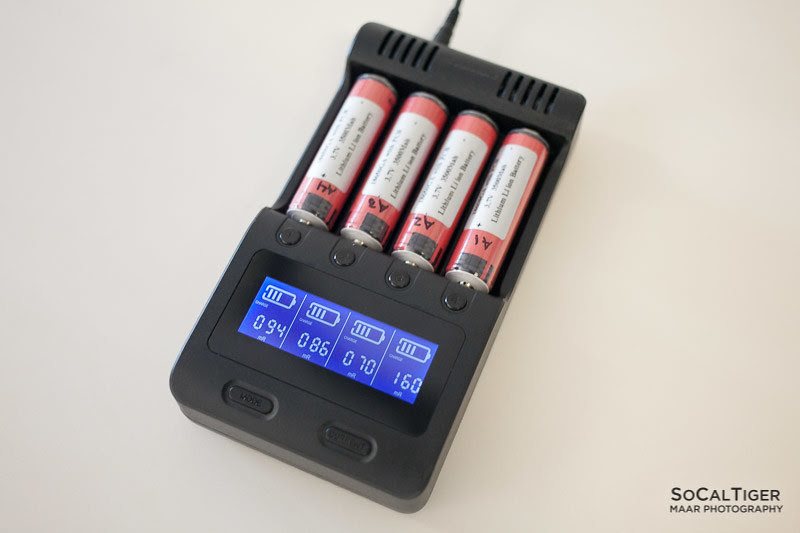 Each slot can operate completely independently (for example, slot 1 can be set to charge, slot 2 can be set to Fast Test and slot 3 can be set to Normal Test). 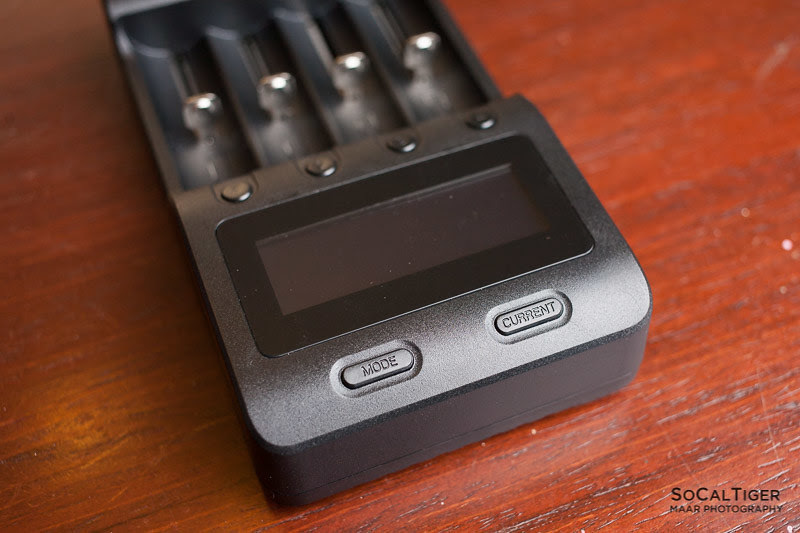 In order to set different modes for each slot, you have to insert each battery one-at-a-time, set the mode and then wait a few seconds before inserting the next battery. Each slot can also have separate a current setting. 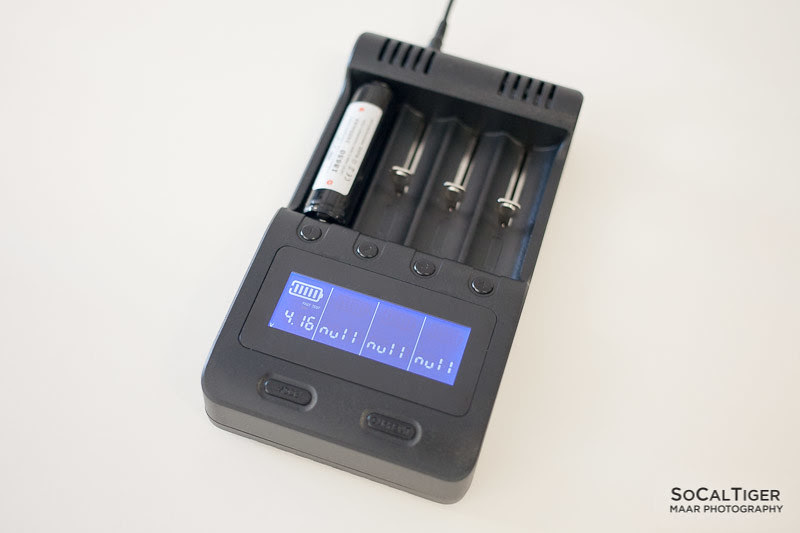 The mode and current is set within 10 seconds of a battery being inserted. 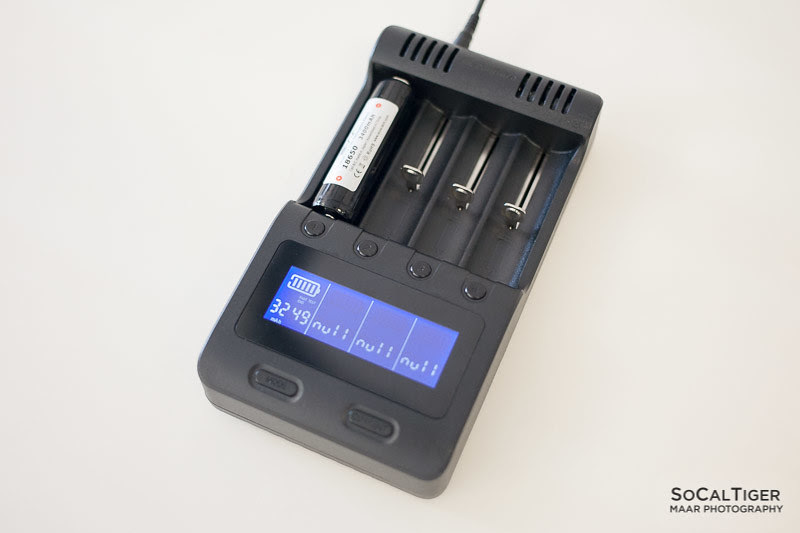 * When battery is inserted, press MODE within 10 seconds to rotate through the modes (Charge, Fast Test and Normal Test). * When battery is inserted, press CURRENT within 10 seconds to rotate through the current options (300/500/700/1000mA for Charge and 300/500mA for Test). 500mA is default. * Once charging/analysis has started, press the individual buttons (1, 2, 3 and 4) to rotate through the display for each slot. * Protected 18650s Fit. The Protected Panasonic NCR18650GAs fit at about 70mm. I estimate that it can fit cells up to about 72mm in length. Someone with a proper caliper will need to measure this. 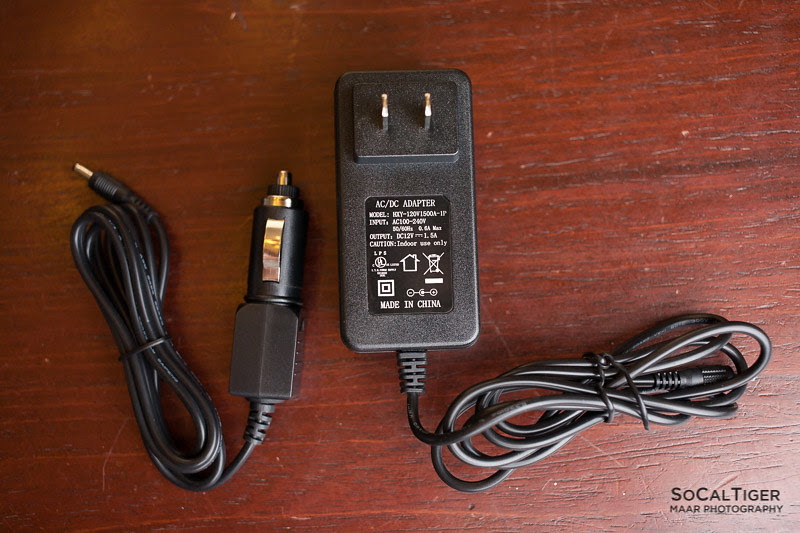 * Like most chargers, 26650s will fit but only 2 will fit at a time in non-adjacent bays (width constraint). 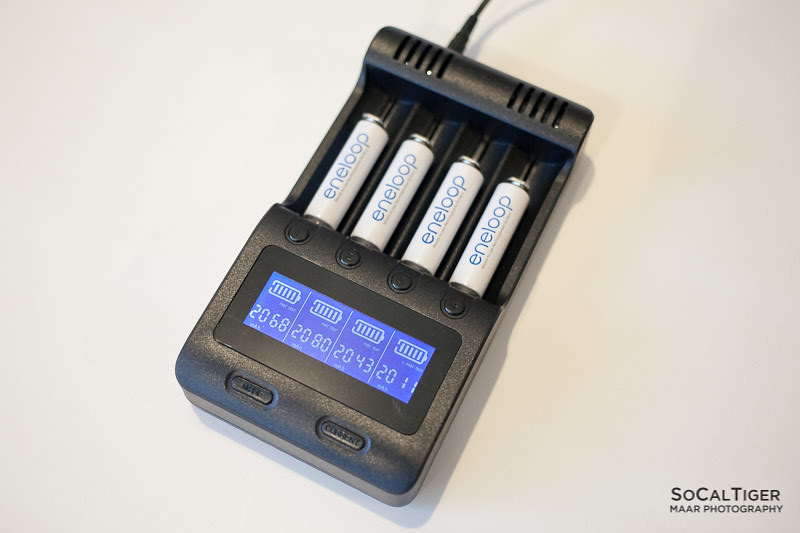 With 1x18650 battery, and main power disconnected, the unit can output 5V 1A via the USB port. With 2 or more batteries, Zanflare states that the output can hit 5V 2A. Always good to be able to see the actual voltage while charging. Charging a single battery works fine. 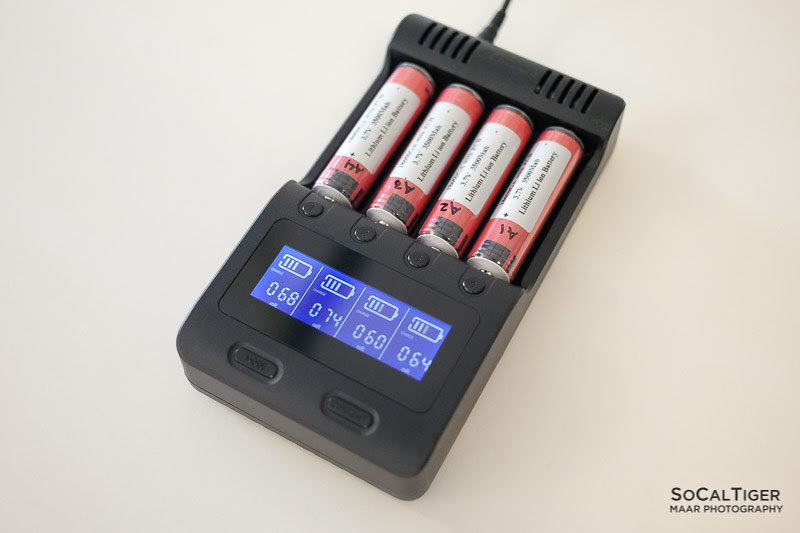 Li-ion batteries charge to 4.16V on the charger. When taken off, the battery measured 4.13V. I consider this a positive as I prefer charging batteries around this range. For comparison, batteries off my VC4 are 4.17V and off my Lii-202 are 4.13V. 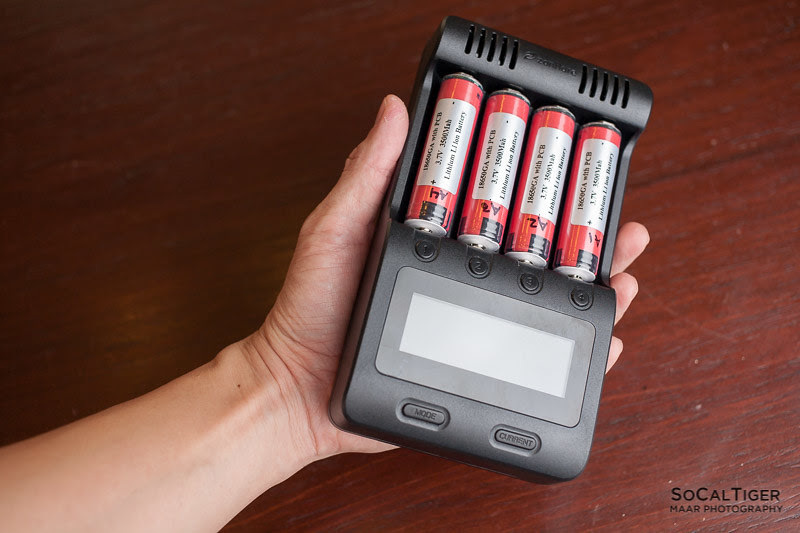 Resistance measurements can vary significantly between readings for the same batteries in the same slots. I observed this with both Li-ion and NiMH batteries. Compare values in next 3 pictures. 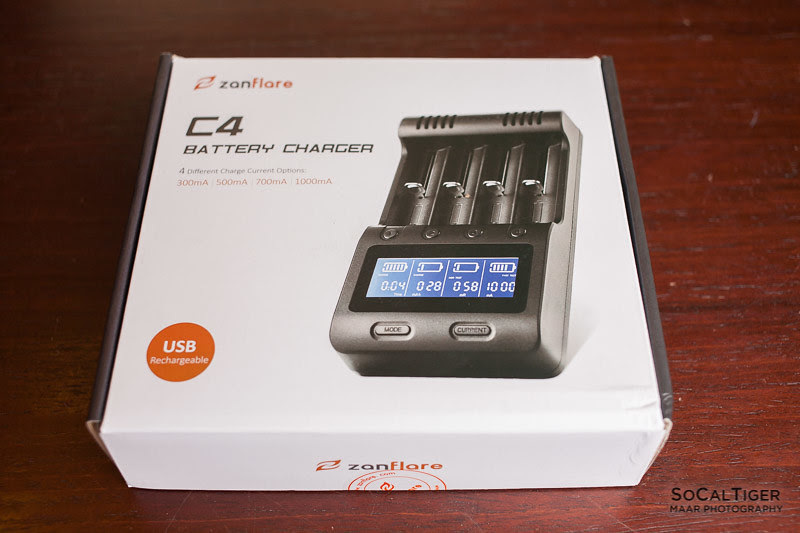 The Zanflare C4 is one of the largest chargers of its type on the market. It is significantly longer than the VC4. Although the VC4 is a little wider and has more spacious outside bays. I would recommend the following changes to make this my ideal charger. Maybe Zanflare can create a "C4 Plus" model. 1) I feel like the existing design is "upside down". Change it so that the display is on top, the batteries "point up" and the power plug goes on the top (side with the display). 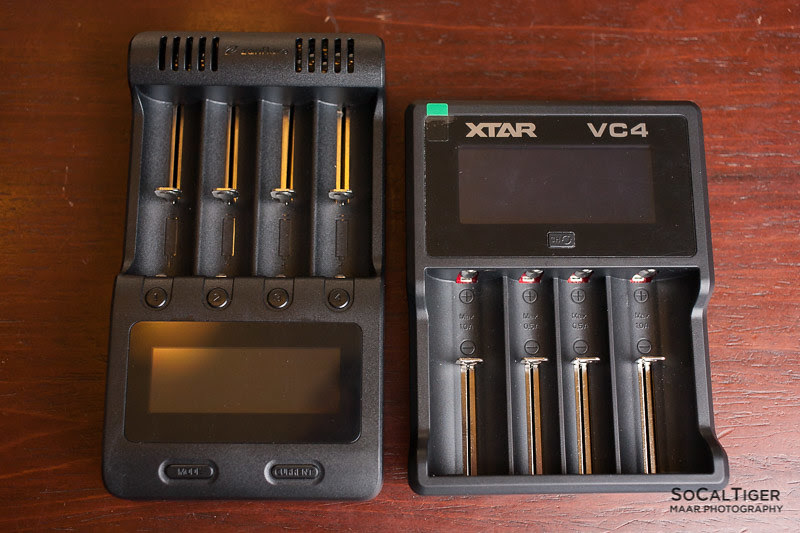 Examples: Nitecore D4 and Xtar VC4. 2) I would "indent" the positive connection where the battery touches. This would make it so that button-top batteries would stay in place better (like the Liitokala). Otherwise, I felt like it was easy for batteries to slide out of place, especially when trying to fit 4 batteries at once. 3) Make the whole unit about 2-3cm wider so that 4x26650 fit and also so putting in 4 batteries is easier. Since this charger is already big, I don't think this would be a problem. 4) Make the individual slot buttons (1, 2, 3 & 4) illuminated with a color LED or put an LED above each slot. Make Green=Charged & Red=Charging/Analyzing. This would make it easier to tell if charging/analysis is complete because it can be hard to see the display from a distance. 5) Make it possible to change the display for all 4 slots at the same time with the MODE button once charging/analysis is started. This would be better than having to click the button for each slot if I want to change the display. 6) Make it possible to have the display rotate through all the information automatically (auto rotate = ON/OFF). 7) Make it possible to keep the display illuminated when main power is connected (always on = ON/OFF). 8) Maybe have a separate "DISPLAY" button which controls recommendations #5, 6 & 7. The C4 is a nice analyzing charger both in terms of function and appearance. 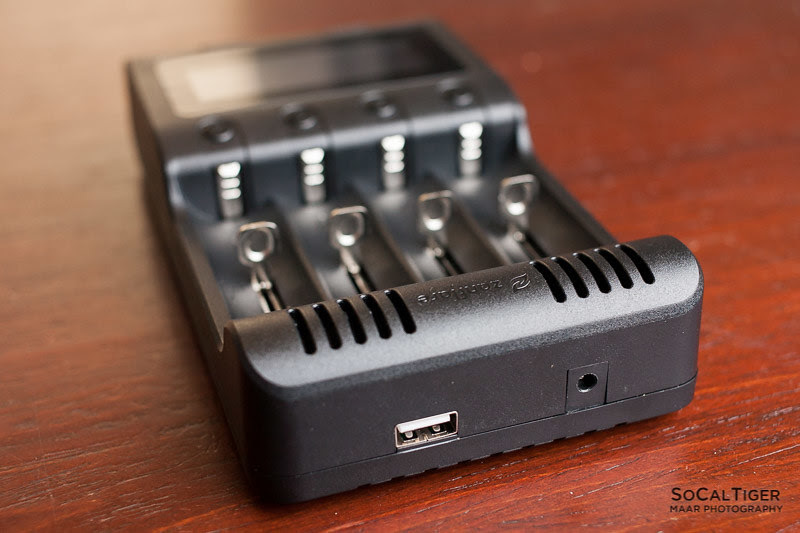 It supports up to 4 18650s simultaneously and can charge up to 2 26650s simultaneously (non-adjacent slots). 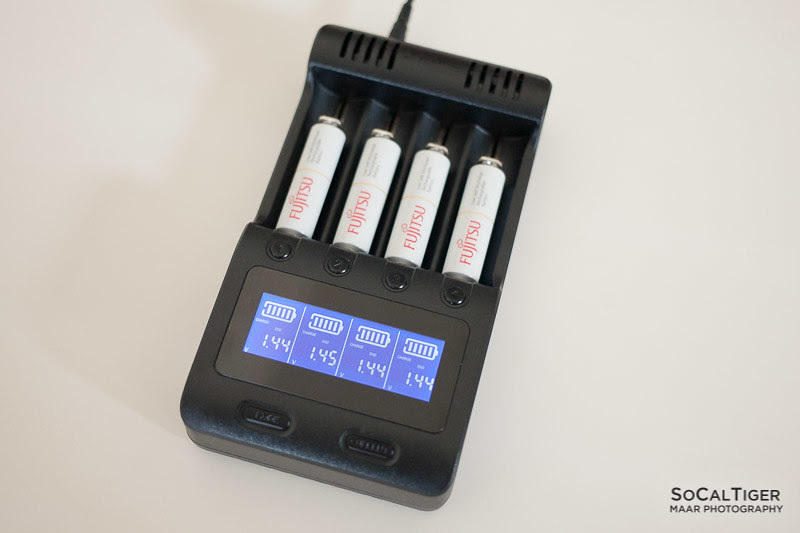 It can also support charging NiMH and NiCd so this makes it a good universal/family charger. It can also fit protected cells up to about 72mm in length although longer and wider cells like GAs feel cramped and tight. It does not support LiFePo or C/D cells. I like the charge and discharge current options (300/500/700/1000mA for Charge and 300/500mA for Test). I know that some people prefer chargers that can support more than 2A+ for charging or 1A for discharging. However, I prefer charging/discharging my cells at lower speeds for better longevity and less heat. I normally charge my 18650s at 500mA regardless of charger used. The 300mA charging option is also great for people charging smaller cells like 14500s. 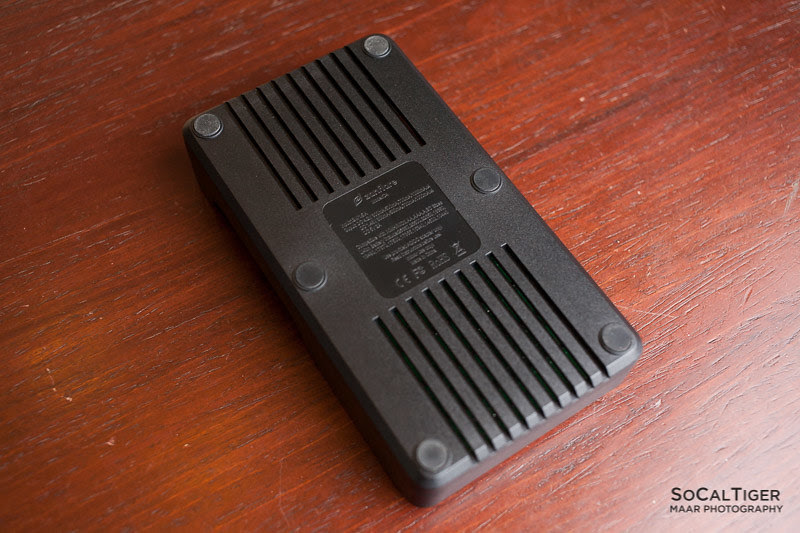 The charger has good size and ventilation and does not need a built-in fan. When charging 4 cells at 500mA, the charger gets warm. When charging 4 cells at 1A, the charger gets very warm (but not overly hot). If someone wanted to add cooling for heavy use, you could set this until on top of a cheap laptop fan since there are a lot of vents on the bottom. I like the display options and the ability to view actual voltage on top of accumulated charge. I also like that there is individual information for each cell so that I can monitor voltage for all 4 cells at the same time. However, I would prefer if the unit/interface was not "upside down" (design preference). I like that the unit is powered with a proper wall/car plug and not USB-powered. The power bank functionality works well and charges my phone pretty quickly even on one cell (1A charge). 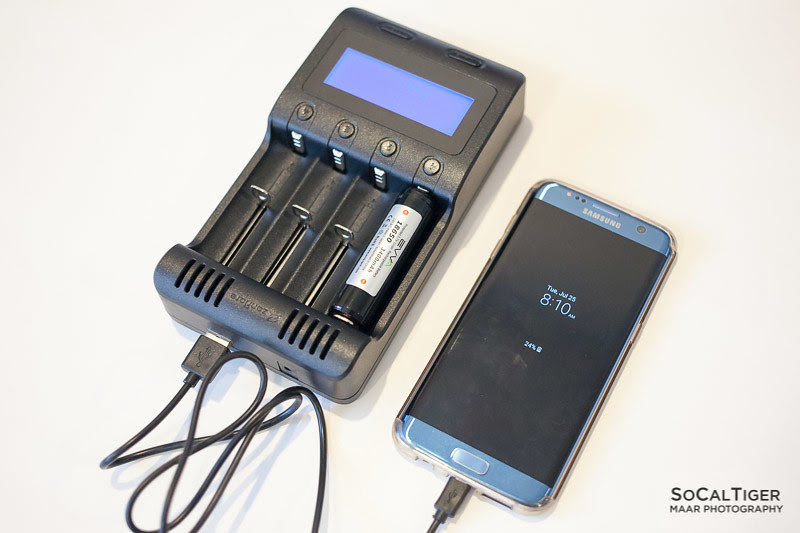 Using cells as a power bank is also a good way to discharge cells (either for storage or testing) without "wasting" energy. My unit terminates charge around 4.16V and the voltage accuracy is within 0.3V when removing cells and measuring them with a voltmeter. Nice review,as always! I am lucky to have one and I am currently using it to charge some old eneloop AA for my camera since travelling to Greece in a few days. Thanks for the review. I’m also looking forward to the HKJ review. 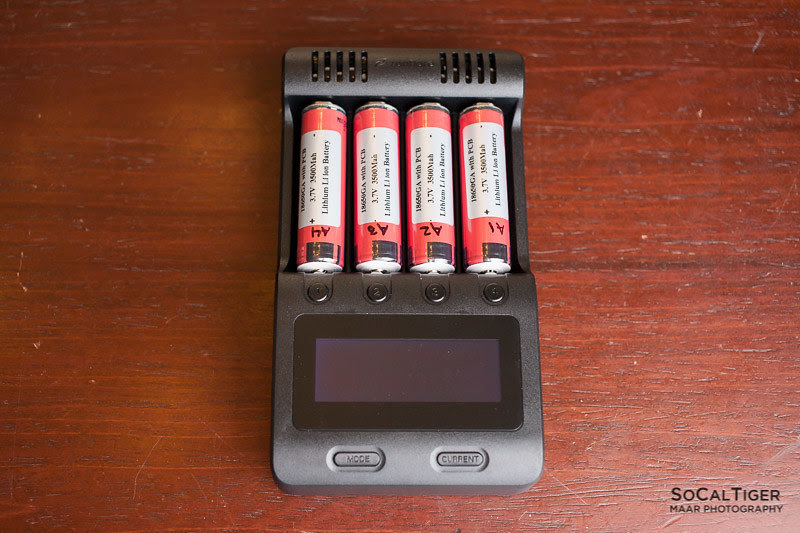 Hi, can you tell me can a slightly longer 18650 (70mm) be fitted in this charger? My Panasonic NCR18650B Protected (bought from GearBest) is longer than a normal 65mm and it fit tight on the 2014 Nitecore i4… Appreciated if you can check for me? I am very likely to buy a new charger, this charger seems to be nice. My old Nitecore i4 is problematic now. Thank you! Those are protected NCR18650GA’s he has in that charger. I have the same ones and they measure 69.85mm. 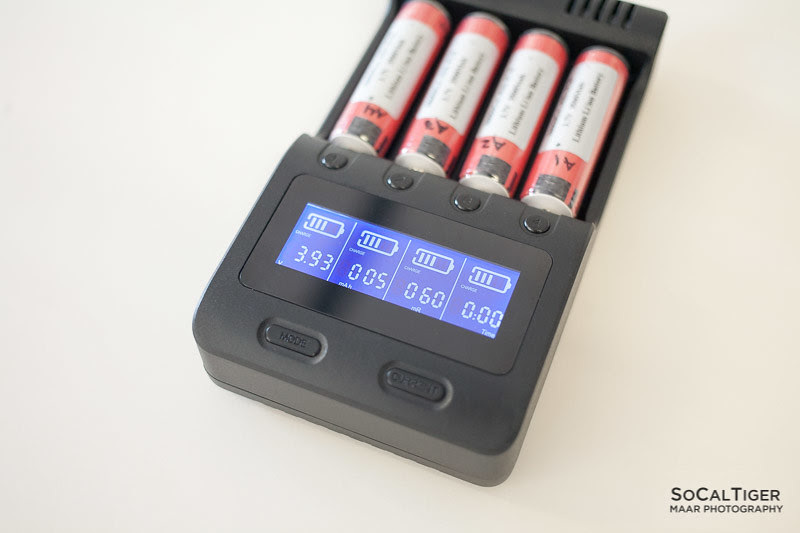 Battery manufacturers don’t make protected cells, third party companies add the protection circuits.